Ever since I installed windows 10 1809, one of my drives is randomly showing files as having no modified date. If I edit and save these files, the date updates, however this applies to thousands of files, so it's not the easiest thing to do. The main issue is that some applications will ignore folders with these files in them. What is wrong here? Is it corruption? Is it a bigger issue? or Should I just go ahead and run an application to touch all the files without dates? SMART checks are all okay and chkdsk passed its standard tests. It appears this question was asked in a similar manner in the "What is the range of dates that windows explorer can display?" and the answer on that post gives some good resources offering a clue explaining. I've dug into those resources and others a bit and will reference quote the parts which I think are relevant and important your question since you posted a bounty it must be important for you to get a verifiable answer. Note: I believe this is a Windows Explorer/File Explorer limitation and not that of the underlying file system. As per the "Interpretation of NTFS Timestamps" post and the results of extensive testing. 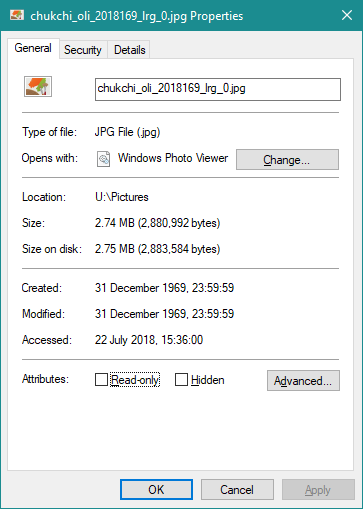 . .
As per the Why do my file creation, access, or modified time disappear if I set it to midnight on January 1, 1980? here relevant information. . .
A customer discovered that if their program used the Set­File­Time function to set a network file's creation, access, or modified time to the specific value of "midnight on January 1, 1980", then the corresponding timestamp is removed. Some time ago, I discussed several timestamp formats you might run into. Today we'll take a logical step from that information and develop a list of special values you might encounter. Note that if you apply time zone adjustments, the actual timestamp may shift by up to a day. Interpretation: The value -1 or 0 as a time_t. Your date fields were destroyed by the upgrade to Windows 10 version 1809, as a result of one of its numerous file-destroying bugs. As the earlier possible date in Windows is January 1st, 1970, your date fields have been set to zero (or maybe -1). If you wish to recover the original dates, your only option is to return these files from backup. If you don't have backups, you may reset all dates of files and folders on disk U to some arbitrary date, just so they don't stay blank. This is the only tool that will try to figure out the original dates from meta-data included in suitable files such as documents and images. In trial mode it will show the changes that the paid version will execute. BulkFileChanger by Nir Sofer with tutorial. A Windows Explorer add-on used via right-click. 5 Free Software to Bulk Change File Timestamp in Windows. Not the answer you're looking for? Browse other questions tagged ntfs windows-10-v1809 or ask your own question. 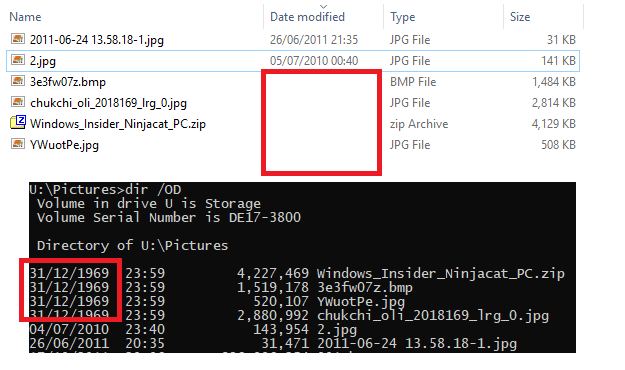 What is the range of dates that windows explorer can display? NTFS permissions - “Inherited from”? NTFS partition no longer accessible, 3 MFT records corrupted, way to fix them?